The Monster Energy Outbreak House residency returns to SXSW 2017 for its third consecutive year. The four-day event will showcase 30 emerging acts and a new partnership with Trap Nation, the world’s largest music channel on YouTube with over 12M subscribers. 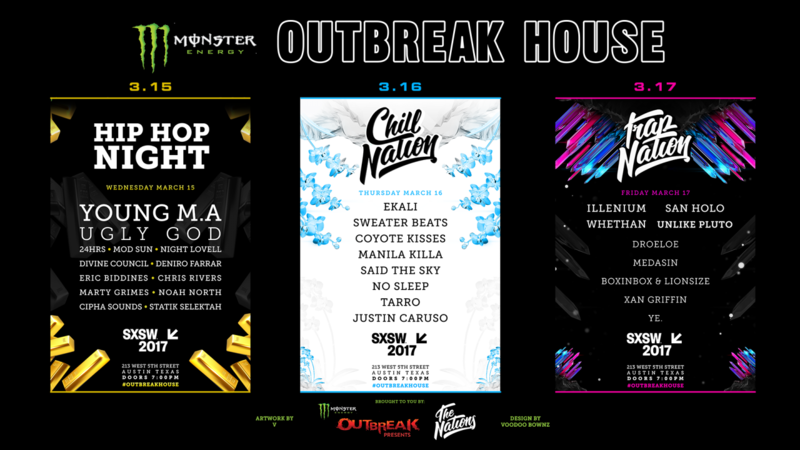 The Monster Energy #OutbreakHouse will feature Young M.A, Ugly God, Illenium, Whethan, San Holo, Unlike Pluto, Ekali, Sweater Beats, Night Lovell, 24Hrs and many more. The Monster Energy Outbreak House @ SXSW 2017 will commence on Wednesday, March 15th and run through Saturday, March 18th. It’s all going down at the Old Antone’s venue on 213 W 5th Street, Austin, TX 78701. Doors open at 7pm each night, with each show running until 2am. In 2016, a new property was formed called the Up & Up Festival. It has rival college students compete online to bring a national artist to perform at their school. And don’t forget to visit the Java Monster Mornings at the Registrants Lounge outside of the Austin Convention Center!